The notion of modernity hinges on a break with the past, such as superstitions, medieval worlds, and hierarchical traditions. It follows that modernity suggests the disenchantment of the world, yet the processes of modernity also create their own enchantments in the mapping and making of the modern world. 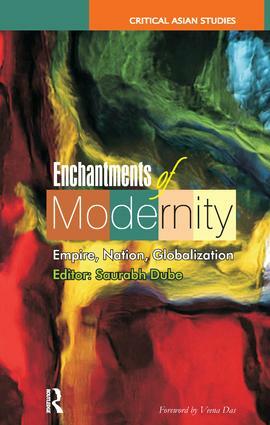 Straddling a range of disciplines and perspectives, the essays in this edited volume eschew programmatic solutions, focusing instead in new ways on subjects of slavery and memory, global transformations and vernacular and vernacular modernity, imperial imperatives and nationalist knowledge, cosmopolitan politics and liberal democracy, and governmental effects and everyday affects. It is in these ways that the volume attempts to unravel the enchantments of modernity, in order to approach anew modernity's constitutive terms, formative limits, and particular possibilities. Saurabh Dube is Professor of History at the Center for Asian and African Studies, El Colegio de Mexico. Critical Asian Studies is devoted to in-depth studies of emergent social and cultural phenomena in the countries of the region. While recognizing the important ways in which the specific and often violent histories of the nation-state have influenced the social formations in this region, the hooks in this series also examine the processes of translation, exchange, boundary crossings in the linked identities and histories of the region. The authors in this series engage with social theory through ethnographically grounded research and archival work.